Dominic Grieve QC MP is the Shadow Justice Secretary and responds here to the question posed by Tim Montgomerie here earlier in the month: Can we end the human rights nonsenses while Britain is still a member of the ECHR? In his recent lecture to the Judicial Studies Board, Lord Hoffmann produced a stinging criticism of the operation of the European Court of Human Rights (Strasbourg Court). This in turn has generated renewed criticism of both the Human Rights Act (HRA) and the European Convention (ECHR), which the HRA incorporates into our domestic law. I was delighted to read Lord Hoffmann’s critique. It supports the reasoned criticisms that we have been making of both the Strasbourg Court and the HRA, and undermines Labour’s mantra that any criticism of either places one in some sphere of illiberal outer darkness. Ever since the Human Rights Act, the government has ducked all debate on any problems that have arisen with its operation, and refused to consider whether there could be better ways to protect our freedoms. But the Act hasn’t worked properly - and this debate is not going away. Lord Hoffmann spelt out as an example how the Strasbourg Court has expanded the right to privacy and family life to second-guess UK regulation governing night flights at Heathrow. His point is that the courts have a duty to apply the law vigorously, but should be wary of law-making, which is the job of elected law-makers. The ECHR allows for the interpretation of Convention rights to differ between states under the “margin of appreciation”, but this is not being allowed to develop as intended. Dominic Grieve QC MP: Is "Britishness" useful or redundant? 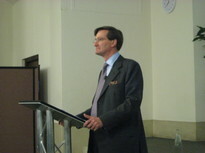 Dominic Grieve QC MP, Shadow Attorney General, explores the concept of Britishness, This is an abridged version of a speech he gave as the 10th Wilberforce Address for the Conservative Christian Fellowship this week. That there is now confusion about Britishness is without doubt. Part of the confusion comes from muddling different concepts. The Government is equating State citizenship with Britishness. But people cannot be told to be British, Britishness is identity which people have to feel while British Citizenship is increasingly seen as a portal to the consumption of State services with no little requirement to subscribe to a common identity at all. These two ideas have clashed. There has been for a long time a consistent pattern of those on the Left attacking national symbols and culture for anti establishment reasons – arguing that it reinforced traditional values and hierarchy and was thus inimical to socialist progress in creating a new society. They have sought to deconstruct it. And as social revolution has been resisted by the innate conservatism of the population the preferred weapon has been the imperative need to adapt Britishness to diversity and multiculturalism. The ex Mayor of London Mr Livingstone, has been a supreme champion of multiculturalism. He devoted a large budget to encouraging compartmentalised self expression in each ethnic or religious grouping under his patronage. The justification is that each has been a victim of discrimination and requires support to assert itself.